Do you feel that rumbling? Is that the energy within our earth stirring? 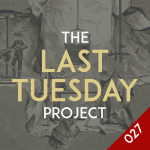 Nah, it's just this month's episode of The Last Tuesday Project!